Starting February 2019, we welcome a special out-of-town teaching couple: the phenomenal professional dancer Natalia Rueda and her wonderful teaching partner Kay Werndli are joining our Nijmegen team to teach intermediate+ classes and a speciality course! Natalia is an international Swing instructor who has been sharing her knowledge and passion for over a decade, and has taught all over Canada, the USA, Mexico, and Europe. She is a Lindy Hop, Jazz, Balboa, and Blues champion and she has trained teams to earn medals at numerous competitions. Natalia began her career in the arts industry in Colombia, where she developed an athletic and vivacious dance style. She started dancing Lindy Hop at age 17 and, at age 19, she had already led a Swing dance team to take a silver medal at the Canadian Swing Championships, one of the many places where she now teaches and judges competitions. Natalia recently moved to the Netherlands, and as you can imagine, we are thrilled to welcome her to the Lindy What team! 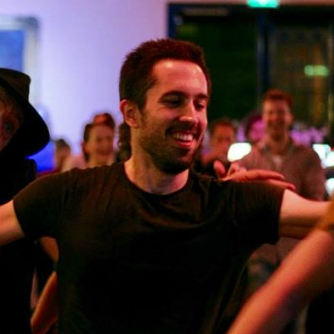 Originally starting to dance Lindy Hop in Bern, Switzerland, Kay soon moved to Stockholm, where he was basically dancing non-stop, trying to soak up as much of the super-energetic Swedish Lindy spirit as possible and finally ended up in Utrecht. His goal is to try to take the best out of these different dance worlds that he has been exposed to and passing it on to his students. In his dancing and teaching, he is constantly striving for that perfect balance between moving together with your partner and being your own dancer because there is nothing quite like when this happens and everything just clicks.